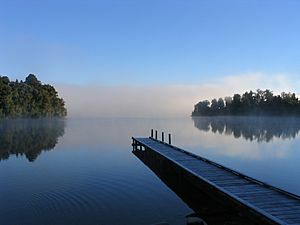 A pier is a raised walkway across water. It can be a simple light wooden structure which has no effect on the current and tides, or a major structure with buildings and as long as a mile out to sea. In the United States, these may be referred to as docks. Canoeing pier in Ontario, Canada. Pier Facts for Kids. Kiddle Encyclopedia.